Yes, those magnolias are larger than my face. And don't they look bloomin' beautiful with the violet peonies, cream roses and eucalyptus sprigs? I'm fancying myself as a bit of a florist following last week's shoot at work - only, these blooms are fake. Faux real, petal. 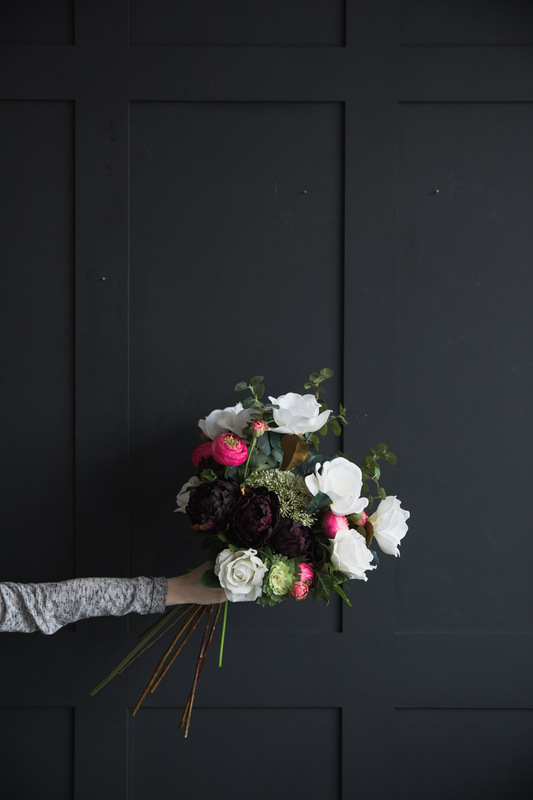 I've become particularly enamored with fake flowers since Rose & Grey first starting stocking Abigail Ahern's beautiful blooms last year. These aren't the plastic tat you find at the pound shop - these faux's are silken to the touch, resembling the feel of real petals. At a glance, or even a stare, you'd think they were the real deal. Only you don't have to worry about your beautiful bouquet withering and wilting; it's here to stay. 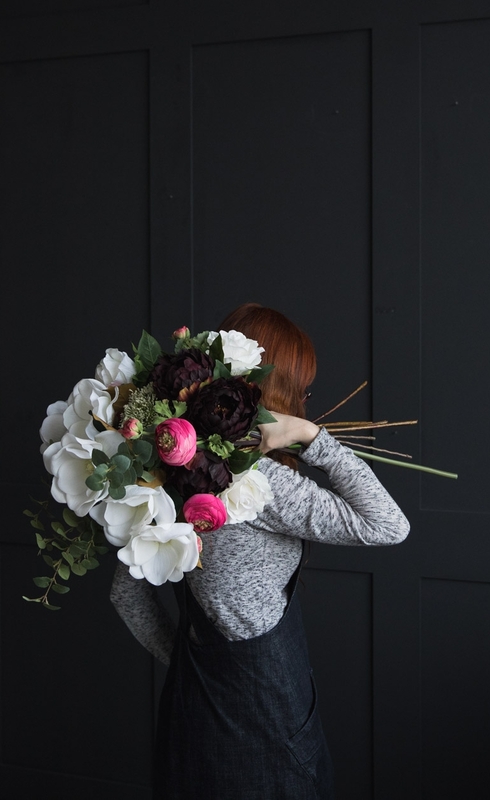 When it came to creating a bouquet, it seemed to come naturally after all those wasted hours scrolling through florist's feeds on Instagram. 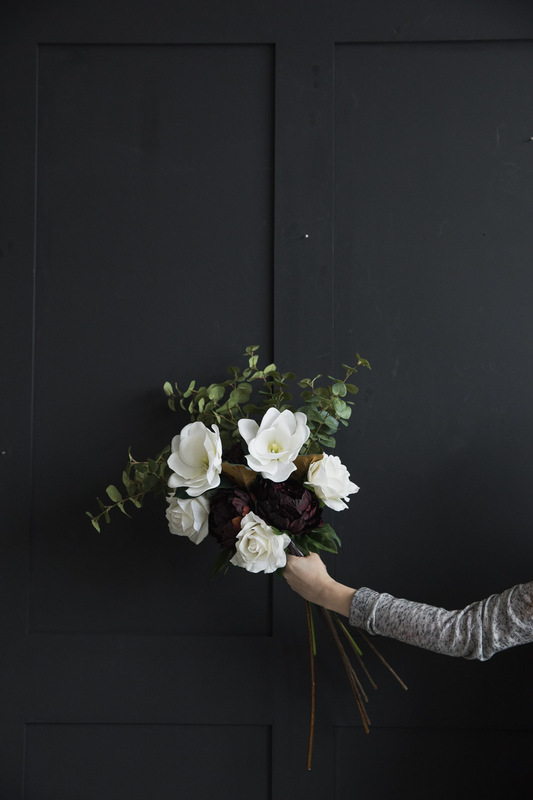 It's those eucalyptus sprigs that really make the bouquet; my top tip from styling these shots would be to build up your blooms based on two or three hues then finish it off with several sprigs teased to stretch outwards from the centre of the bouquet. The wilder the better, I say! I'll keep this simple and let the pictures do the talking. Scroll to the end of the post for credits.